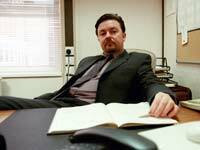 David Brent was the Regional Manager based at the Slough Office of Wernham Hogg. He is a philosopher to rival Descartes, a musician to rival Texas, a dancer to rival MC Hammer - and has an acute grasp of political correctness. Yet the BBC documentary crew that filmed him at work in The Office stitched him up and portrayed him as the 'boss from hell'. Sadly, despite giving his all to his work and to his staff, David was made redundant at the end of the second series. The cameras seemed to show a broken man when in fact David Brent was about to turn the negative into a resounding positive by launching his solo music career. Brent never really left Wernham Hogg. His legacy of good humour and maverick management techniques live on there to this day. Also, he pays visits, often as much as three times a week.